Space Safety » Archive » Space Hazards » Radiation » Could a Vegetable Compound Protect Against the Effects of Radiation? 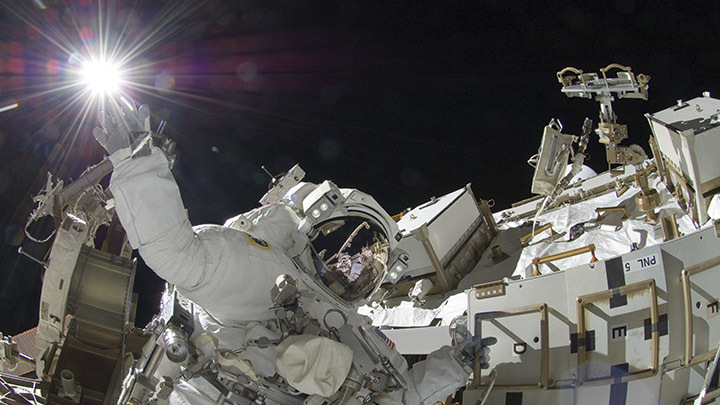 DIM could be used to protect astronauts during space travel (Credits: NASA). A compound found in cruciferous vegetables such as cabbage, broccoli, and cauliflower may be the key to radiation protection, scientists have found. The compound, called 3’3-diindolymethane or DIM, is under investigation as a cancer preventative agent. Used as a potential medical countermeasure, DIM may be able to prevent or mitigate acute radiation syndrome due to whole body exposure. Previously studied as a cancer prevention agent, this is the first instance in which DIM has been considered as a radiation protector. The early stage laboratory study administered DIM to rodents in a multidose schedule in order to identify whether DIM could protect against the effects of exposure to radiation. Results from the experiment demonstrated that the compound protected the animals against lethal doses of body irradiation up to 13 Gy. This was the case whether DIM dosing was initiated before or up to 24 hours after radiation exposure. The irradiated rodents injected with DIM survived longer than those left untreated. DIM could protect normal tissues in patients receiving radiation therapy for cancer (Credits: CTCA). It is uncertain whether an outcome similar to the irradiated rodents treated with DIM is possible in humans. However if so, the potential applications for DIM may venture into orbit as a radioprotector for astronauts exposed to the harsh environment of space. With the duration of time that astronauts spend in space set to increase with future Mars and asteroid missions, DIM may provide a method of radiation protection that is sustainable and that can be grown in-situ due to its vegetable origins.